The Guernsey County Sheriff’s Office consistently and with uniformity strives to maintain social order and provide professional law enforcement services to citizens in the community, within prescribed ethical, budgetary, and constitutional constraints. This agency strives to enforce the law and maintain order in a fair and impartial manner, recognizing the need for justice, and the consistent appearance of justice. The Sheriff recognizes that no law enforcement agency can operate at its maximum potential without supportive input from the citizens it serves. This agency actively solicits and encourages the cooperation of all citizens to reduce the limit and opportunities for crime and to assist in bringing to justice those that break the law. 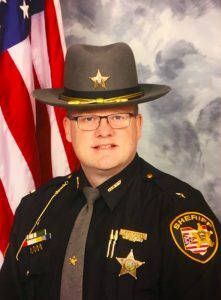 It is the mission statement of the Guernsey County Sherrifs’ office to enforce the laws if the state of Ohio, to deter offenses against the public, in the most efficient and cost effective manner. Schedule your concealed carry appointment today!